The closest full-service hospital to UC Santa Cruz is six miles away. Despite being a full-service hospital, it does not provide a service that around 45 percent of college-aged people seek — all-encompassing reproductive health services. Dominican Hospital, a branch of Dignity Health, is a Catholic-affiliated institution and the only emergency facility in the city of Santa Cruz. Because of its religious affiliation, it does not provide non-Catholic sanctioned health services including abortions and contraceptives. These services could be of use for the 12- 23 percent of college students in the U.S. who report to have unexpected pregnancies. Last year, after finding out she was pregnant through a home pregnancy test, UCSC student Debra Reid* frantically entered Dominican Hospital due to painful cramps in her lower abdomen. She checked into the emergency facility and received a prenatal screening test. California, Arizona and Nevada, in 2012. This was to include both their Catholic and non-Catholic affiliated branches. 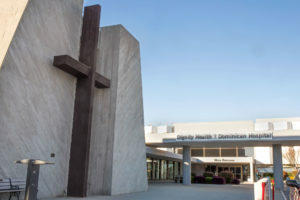 The Catholic branches of Dignity Health such as Dominican Hospital do not provide all-encompassing reproductive health resources, such as abortion and birth control, while their non-Catholic affiliated branches do provide them. Currently, there are no secular emergency facilities in Santa Cruz city. A merger between Dignity Health and Catholic Health initiatives, a health organization whose mission and core values are grounded in Catholicism, is set for later this year. The merger could mean all current Dignity Health hospitals nationwide would abide by Catholic guidelines and would not offer all-encompassing reproductive health services. Dignity Health currently contains 15 non-Catholic affiliated branches and 25 Catholic-affiliated branches. While there are no hospitals in Santa Cruz County that would be affected by this merger, non-Catholic affiliated locations in the Bay Area, such as Sequoia Hospital in Redwood City, could end their provision of contraceptives. The merger would also stop hospitals that are currently non- Catholic affiliated from giving patients referrals to different facilities that provide the resources that would be taken away. Dominican Hospital already does not give referrals to different facilities. Because Debra Reid’s doctor at Dominican Hospital refused to discuss alternate unplanned pregnancy resources with her, she felt her needs were not met. The lack of discussion resulted from the hospital’s affiliation with the Ethical and Religious Directive (ERD) guidelines, according to a Dominican Hospital representative. “Sterilization or abortion services are not provided at Dignity Health’s Catholic facilities in accordance with the Ethical and Religious Directives [ERDs] for Catholic Health Care Services and the medical staff bylaws,” said a Dominican Hospital representative. The ERDs, established in 2009 and grounded in biblical verses, serve as a way to provide guidance on moral issues surrounding Catholic health care. They prohibit the prescription of contraceptives, conducting assisted suicide and direct sterilization, a term used in Catholic circles referring to the sterilization of reproductive organs for contraceptive purposes. 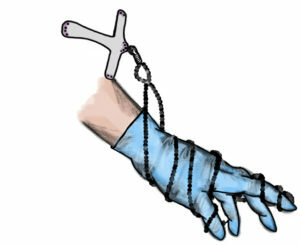 These services are denied to patients on the basis of material cooperation, a Catholic term defined as an individual unintentionally helping another person do something morally corrupt. However, if the mother is in life a threatening condition, according to the ERDs, her life should be prioritized over the fetus and whatever procedure necessary to save the mother’s life should be conducted, even if it results in terminated pregnancy. One in six hospitals out of the 5,534 in the United States operate under these ERD guidelines. The ERD policies forced Debra Reid to conduct independent research on her pregnancy options. She went to Planned Parenthood in Santa Cruz and made an appointment for the in-clinic medical termination procedure, but due to special circumstances she was referred to San Jose. This is not standard procedure, said director of public affairs at Westside Planned Parenthood Lupe Rodriguez, as most patients can receive surgical services at the Santa Cruz center. Though Westside Planned Parenthood currently offers all- encompassing reproductive health care, such resources have not always been accessible in the city of Santa Cruz. When UC Santa Cruz was founded, there were no contraception or reproductive health services on campus. The lack of reproductive services for students, as well as minors, encouraged Cynthia Mathews, a current member of the City Council, and others to establish Westside Planned Parenthood in 1971. Operation Rescue, a Christian- based militant anti-abortion group now renamed Operation Save America, continue protesting Planned Parenthood. Dominican Hospital did not actively engage in supporting Operation Rescue and did not fund any anti-abortion groups. During this time period, the hospital stayed grounded in its anti-abortion policies in association with Catholicism. Today, Dominican backs and partners with several community organizations that focus on women’s health services, said a Dominican Hospital representative, including Santa Cruz Women’s Health Center and the East Cliff Family Health Center, both of which do not provide termination services. The representative did not include Westside Planned Parenthood in the list of organizations Dominican supports. Events such as the merger between Dignity Health and the Catholic Health Initiatives affect the future of all-encompassing reproductive health care, as do nationwide changes to programs like Planned Parenthood. Debra Reid feels these services are crucial, especially in Santa Cruz. hour away from the 16 to the 71. WESTSIDE PLANNED PARENTHOOD is located in downtown Santa Cruz about 10 minutes away from UCSC by car and 15-30 minutes away via any numbered metro bus. • Pregnancy Options and Information Information on how pregnancy happens, avoiding pregnancy, pregnancy tests, prenatal care, the stages of pregnancy, miscarriages or ectopic pregnancy, pre-pregnancy health or infertility. Options for an unintended pregnancy. In original reporting the founding date of Dominican Hospital was misstated. It was founded in 1941. The non-Catholic affiliated branches were previously mischaracterized and, in addition to the Catholic-affiliated branches, do not provide abortion services. The statement, “The lack of discussion resulted from the hospital’s affiliation with the Ethical and Religious Directive (ERD) guidelines” was misattributed to a Dominican Hospital representative. Additionally, Dominican does provide referrals to other facilities, but not abortion providers. Previously, it was uncertain if the merger between Dignity Health and Catholic Health Initiatives would alter the reproductive services provided by Dignity Health branches, but a Dominican Hospital representative specified the merger won’t affect any services provided.